AES expert appliance team expands KitchenAid appliance repair to Pasadena. KitchenAid appliances have enjoyed a resurgence of popularity in and around Pasadena over the past several months. To meet this demand for KitchenAid service, AES has obtained factory certification in the complete line of KitchenAid home appliances. As Pasadena and many other communities throughout the San Gabriel Valley clamor for installations and repair of KitchenAid household appliances, AES has allocated factory-trained and certified KitchenAid appliance technicians in and around Pasadena. Dial (800) 520-7059 and get 25% discount for new customers on any KitchenAid appliance repair service in Pasadena, CA and surrounding areas! KitchenAid, originally known for its stand mixer that was born in 1919, the company has methodically expanded to manufacture all major cooking and cleaning appliances. Now, your KitchenAid appliance repair Pasadena expert appliance repair technician has earned KitchenAid factory certification. The KitchenAid certification means a lot. It is your guarantee that Pasadena appliance repair technician servicing your appliance has gone through rigorous factory training and testing in order to bring high quality service to your home. AES strives to maintain its reputation as masters in KitchenAid appliance repair in Pasadena, CA. In fact, many of AES technicians are European-trained electrical and mechanical engineers as well as best-in-class appliance repair technicians. As a result, not only do Southern California homeowners get expert KitchenAid appliance service, but, appliance repair technicians who understand the principals of manufacture behind every KitchenAid appliance. Clearly, with that much brand familiarity, training and expertise, KitchenAid Repair Center provides its customers with a 100% guaranteed and best-in-industry warranties on parts and labor. Have you purchased a new KitchenAid cooking appliance? Many brands offer an extended warranty when customers use a brand-certified appliance service provider for initial installation. A good start makes great sense all around which is why kitchenAid Repair Center in Pasadena is the best choice when installing, maintaining or repairing your KitchenAid appliance(s). Troubleshooting and Prevention. KitchenAid appliance repair Pasadena firmly believes that it is more intelligent and less costly to maintain your KitchenAid appliance than to call for service only when the need become vividly apparent. When you adhere to a regular maintenance schedule with AES, your KitchenAid appliances will last longer and work better. AES always checks wires, thermostats and general machinery of your KitchenAid appliances and troubleshoots other potential problems with each service visit. Don’t be shy with your questions. 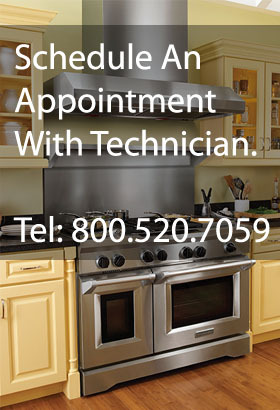 Your local Pasadena KitchenAid appliance repair technician is a great personal resource. They will answer questions, teach you how to optimally operate your appliances and how to troubleshoot in-house. To schedule emergency KitchenAid appliance repair in Pasadena, CA, please dial our toll free number: 800.520.7059 or make a request online.